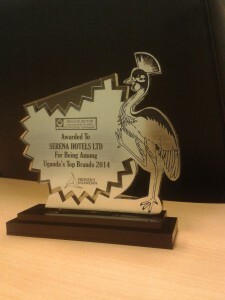 The Private Sector Foundation Uganda (PSFU), in its annual award ceremony recognized Serena Hotels Africa among the Top 50 Uganda brands. The selection process comprised of three stages that included an onsite audit of the business, a consumer opinion survey and voting by text message.Speaking at the award ceremony on Friday 22nd August 2014, the Executive Director of PSFU, Mr. Gideon Badagawa said �the idea behind the recognition of the top brands in the Country is to reward companies that have made it in the minds and hearts of the consumers despite several challenges and as part of the national golden jubilee�. According to Mr. Badagawa, a brand is considered a winner if it is committed to the well-being of the Ugandan people through provision of employment, innovation to expand economic and social well-being, contribution to the country�s tax revenue and generally through corporate citizenship. Anthony Chege, Country Manager, TPS (Uganda) Limited said that �recognition for excellence is indeed an honor in itself, and the sustainable integrated ethical approach to development of the Serena brand for over four decades with a current portfolio of twenty four properties in six African Countries is gratifying�. The expansion of the Serena Portfolio into Uganda began with the opening of Kampala Serena Hotel (Member of The Leading Hotels of the World) in Year 2004, and in line with its medium to long term objective to create a leisure circuit in Uganda similar to our well established Kenyan and Tanzanian operations, Serena Hotels took over the Lake Victoria Serena Resort & Spa, Entebbe in year 2009. Collectively, the total room inventory is 276 and the properties directly employ 723 staff of which less than 2% are non- East Africans. In the year 2013, TPS (Uganda) Limited paid direct and indirect taxes amounting to UShs. 12.8 Billion (Approximately US$ 5 Million). The Company continues to work on supporting the growing Tourism industry in Eastern Africa by seeking investment opportunities and validates its belief that with the changing nature of guest expectations, it is the quality of service and product that will continue to determine the destination choices which clients make. Beginning April 2013, TPS (Uganda) Limited entered into a contract with Lobster Ink,a South African based Company specializing in training staff on service delivery in the hospitality industry benchmarked to Leading Quality Assurance (LQA) Standards. The program at Kampala Serena Hotel is co-financed with DEG (the investment arm of the Federal Republic of Germany � Technical Assistance Program). To date, 93 students from selected hospitality colleges/learning institutions have been given the opportunity to attend the hospitality skills training courses conducted at Serena Hotels, resulting in improving the quality and skills of students for the Ugandan Tourism Industry. The enthusiasm and cooperative spirit shown by Uganda's President Museveni , tourism officials and your active private sector has been outstanding, and our advance promotion for the event in Kampala is well underway. An outline of editorial topics, the 2004-2005 distribution plan and an advertising contract will be e-mailed to you in a few days. Here is a brief introduction of ATA's 'two for one' advertising package. The 'heart' of that edition will be the "Grand Tour of Uganda" section, covering a full menu of 'proven' tour options. Your advertisement will be prominent, up front in the Grand Tour of Uganda Section. By then, Uganda's Grand Tour content will be expanded, with photos and stories from post tours by our editors and official photographer, following the ATA 8th Cultural and Ecotourism Symposium in Kampala, Uganda. ATA delegates, guests and officials at the 30th Jubilee in Nairobi, Kenya will receive the first copies of this souvenir edition. (3) Following these two top ATA events in Africa, the Grand Tour of Uganda insert will be distributed as a magazine on its own, reaching out to new markets in North America and worldwide. For example, ATA has scheduled appearances at a series of travel trade shows in New York, Washington, DC, San Francisco, Miami, Chicago and Boston, with exhibits at most. We will also promote with African exhibitors at the World Travel Market and Indaba. A mass circulation program involving partners from Uganda, will aim at distribution through major newsstands and libraries in Africa, America and beyond. You will also receive a full year's advertising on our ATA website, with a button link. Your space on the site will be equivalent in size to your ad in our printed magazine. We feel this Grand Tour concept is a breakthrough, and your advertising message will receive a much longer run than conventional magazine advertising. As soon as your advertising space is booked, we will include your advertising message and link on the site. We welcome your input on editorial topics and will be consulting you regarding tour content and options. Please let me know your direct telephone line for future interviews and conference calls. I look forward to meeting you and becoming a long term partner in marketing.